The city of Gainesville is a wonderful place to call home. Located along the Interstate 35 corridor just 67 miles north of Dallas, it offers easy access to the larger metropolitan areas of Texas, but has its own quiet, residential charm. Today, this city is made up of a charming blend of residential homes and apartments, manufacturers, and agricultural areas. You won’t find a more welcoming place to call home than Gainesville! Gainesville is a diverse small city of just over 15,000 people. About one third of the households in the city include children under eighteen, and another third of the city’s households is made up of singles living on their own. The average Gainesville family includes a child or two, and the city’s median income is about $30,000. Home to the headquarters of the North Central Texas College, Gainesville does attract many college students looking for an affordable two-year degree or a start to a four-year bachelor’s degree. NCTC started as Gainesville Junior College in 1924, and it’s been around ever since. Now, NCTC is especially known for its health science program, as it offers high-quality programs for nursing assistants, nurses, EMTs, and radiology technicians. On the elementary and high school levels, Gainesville is served by the Gainesville Independent School District. The district is made up of the Gainesville Head Start program, Thomas A. Edison Elementary, Robert E. Lee Intermediate, Gainesville Middle School, and Gainesville High School. Gainesville Independent School District also boasts a 15.3 to one student to teacher ratio. The Gainesville Varsity Football team, in time-honored Texas tradition, has worked hard to win state championships – the most recent in 2003. And the football team is proudly known as the starting point for several NFL football players, including Darcel McBath, who played first for Texas Tech University and then for the Denver Broncos, and Kevin Mathis, who played for the Dallas Cowboys, Atlanta Falcons, and New Orleans Saints. Much of the economy in Gainesville is associated with the Thackerville WinStar Casino, which is currently expanding. Many of the casino’s employees live in Gainesville, and the casino provides and economic boost, as many of its visitors stay in Gainesville hotels. Gainesville is also home to several manufacturers, as well as a large outlet mall. Gainesville is a great place to live because, even being a relatively small city, it provides plenty of great attractions for residents and visitors alike. Spend the day shopping, or go to the zoo. Gainesville has a wonderful zoo – the Frank Buck Zoo – and several city-run parks. This includes Leonard Park, which features baseball fields and a 15,000 square food playground that children love. The city also runs other parks, including the BP Douglas Park, Forsythe Transportation Skate Park, Heritage Parks North and South, and the Pecan Creek Park. The city also operates a 45-acre soccer complex. 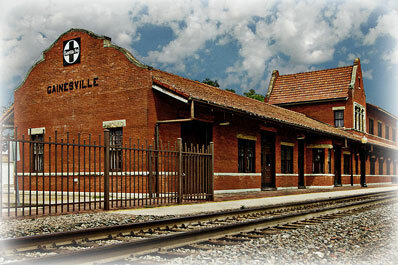 Besides this, Gainesville attracts visitors with its historic train station, featuring a ¼ size mini replica steam engine passenger train, which can take up to fifty passengers on a tour of Leonard Park. As you can see, there’s much to love about a place like Gainesville. If you’re ready to enjoy the perks of living in a city without dealing with all the noise and traffic of a true metropolitan area, Gainesville is a wonderful place to call home.